1- They are not important (Michel Aoun during his joint interview with Hassan Nassrallah last year, said that this was not a major issue…and those in jail for fighting for Aoun – while he was hiding in a French embassy- should I think kill themselves out of shame). 2- They are guilty…Yes, they are guilty of being anti-Syrian, they should be hanged…this is how Arab Democracy should be. 3- They love torture …no doubt about that, if they did not love being tortured they wouldn’t have chosen to (Arab) democratically go to jail. 4- They are getting free diet sessions (one prisoner who was released last year recalled how he got 1 potato – rass batata – a day). 5- They are anti democratic. If in Syrian jail, that must be because they are against the Arab Syrian Democratic Republic! 6- They simply do not exist – Sayyed Hassan Nassrallah in his celebration speech for Samir Quntar, listed the Resistance’s next objectives: and Lebanese in Syrian jails did not make the list... Lebanese citizen Sayyed Hassan set the freedom of 4 Iranian diplomats in Israeli jails as an objective, rather than those Lebanese prisoners; that must be because they do not exist. THERE ARE NO POLITICAL PRISONERS IN SYRIA. I WONT BE SURPRISED IF A BRIGHT LEBANESE POLITICIAN (WE HAVE SO MANY AROUND)WILL ONE DAY CLAIM THAT THERE ARE NO JAILS IN SYRIA. It being a Socialist utopia run by the people for the people, everyone is happy and crime is inexistent. PS: My comment is in no way directed against the Syrian people, but it is time to call an orange an orange. Setting aside another episode of "It’s all about Michel Aoun, the bad, the ugly, and Armageddon too", the devil is in the detail and you seem to have addressed the issue of the Lebanese in Syrian jail in your opinion. 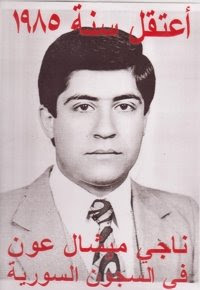 You mention that those prisoners should hang, kill, torture, etc... themselves, but the real questions are 1) are they still alive, 1985 (not to mention that Mr. Aoun came to notoriety in 1989, but who’s counting) is a long time ago and let’s face it our track record on human rights in the Middle East makes the likelihood of those prisoners remaining alive to date highly unlikely 2) Did they actually make it to Syria or were they murdered before leaving the Lebanese territory, and 3) Who really killed them? After all, we are notorious in Lebanon for killing our own and blaming it on others. Quick refresher: Kannissat Saydate el Najatte, Bachir Gemayel, etc. Surely it wouldn’t come as a surprise to many if this were the case. I understand your frustration vis-à-vis Mr. Aoun. He is a very controversial not to mention verbally inappropriate figure, but in the bigger scheme of things, the issue of Lebanese prisoners in Syria should be addressed at the national level; yet you choose to assign all blame to Mr. Aoun because of his opinion on this issue? Aren’t you giving him too much credit? Where does the failed government of the failed State of Lebanon fit into all of this? And that my friend is calling a cat a cat. Answering your vain attempt to portray Syria as a victim of Lebanese violence, is not worth any comment. Your article is about Mr. Aoun and the part of god and you're accusing me of portraying Syria as a victim of Lebanese violence. Where you not involved in writing the article? Nonetheless I deserve your answer. I should have known better than to respond to an article that lacks journalistic credibility and where facts are distored for political gains. Your obsession with Aoun is overwhelming your feelings. So I will not argue on the details of the post with someone whose emotions control his mind. Now if you insist, go defend Syria if you which. I will respect your opinion, and I am sure Arab Democracy.com will publish it...and I will be glad to read your "factual", "journalistic" & "objective" take on things. Jihad! Dude! Are you for real?!? I feel like I'm arguing with a 10 year old? You're Jihad Bitar from Jamhour right?